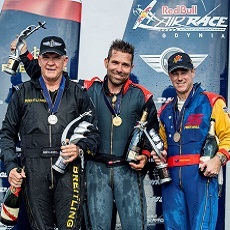 Matt Hall has arrived in the UK for the upcoming 5th round of the Red Bull Air Race in Ascot (August 16th-17th) and will be looking to emulate some of teh successes of Australian horses, trainers and jockeys in recent years at the same track. Matt heads into the Race with some solid momentum after capturing back to back podiums over his past two races at both Putrajaya,Malaysia (3rd) and Gdynia, Poland (3rd). The seven points Matt earned in Poland move him up a place to fourth in the overall standings at the halfway mark of the season, his 21 points within striking distance of third placed Nigel Lamb (26). Matt recently announced he will again be taking part in the NYE celebrations on Sydney Harbour for the next 3 years. He also appeared on Channel 7’s Sunrise show for a feature story.